My past visit to No visit is complete without an order of coffee at Common Man. I’m far from being a coffee connoisseur, but the cup of Cappucino (RM12) we had – was marvelous. Kefir juice is good for digestive health they say. We ordered a Fresh Juice (RM14) consisting of pineapple, coconut water, kefir water and passionfruit. The Grilled Juicy Chilli Boneless Chicken (RM38) was a really simple dish, executed pretty well. Grilled chicken seasoned with just the right amount of chilli flakes – making the dish savory without being overwhelmingly flavorful, served with a avocado salsa and caramelised lemon at the side. I have to note however that a portion of the chicken felt a little dry however. We finished it nevertheless. We really enjoyed the Broiche French Toast (RM27) also. It was delicious, buttery and had the perfect fluff to it. Served with beries compote, maple syrup and premium vanilla ice cream. Overall Rating: 7/10. I really liked the cafe – the gorgeous space, the unwavering customer service, and the Broiche French Toast. The Grilled Chicken was delicious but came a tad dry for my liking. Having said all of that, I felt that prices were unavoidably high for my comfort. Expect to fork out at least RM50/person for a brunch experience here. Address: 1, Jalan Tun Mohd Fuad, Taman Tun Dr Ismail, 60000 Kuala Lumpur. Next in the list, Shugatori Dessert Cafe – the new boys on the block. The cafe was packed when I got there that eventful Friday evening. Who says I can’t have dessert for dinner? I love pandan flavored pancakes, and the Local Temptation (RM23.90) did not disappoint. The pandan flavored pancakes was layered with coconut jam, topped with a scoop of coconut ice cream, which had tiny chunks of coconut inside, drizzled with gula melaka syrup. At the side, mango, strawberry cubes and meringue bites. Having said all of that, I felt that this dessert came exceedingly overpriced for it’s portion. The size of the pancake was ridiculously small and it really only took a few bites to finish. Raise the bar please! 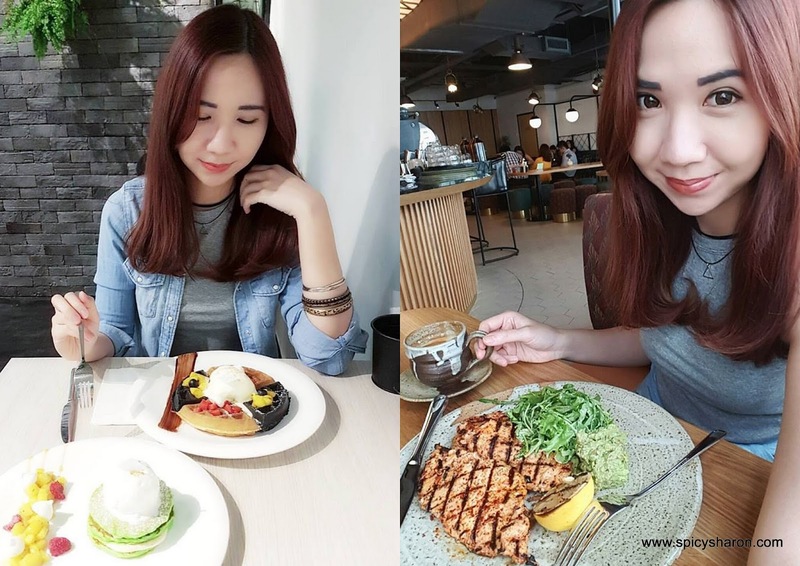 The Yin & Yang (RM21.90) consisted of two halfs of charcoal and classic waffles, which came perfectly toasted and had slight differences in terms of taste (try it and tell me!). Each waffle was topped with either minty mango, strawberry compote, meringue crisp and roasted almond nib. The vanilla ice cream was quick to melt but a pleasure to devour (menu says chocolate however). Overall Rating: 6/10. The ice cream was melting; the crowd was moving and bustling – I was obviously pressured to finish my dessert as quickly as possible. I really liked what I had, but the main setback for me would be the unjustifiable portion and prices. For that price, I was seriously expecting a larger serving of pancakes, if not an A+ for creativity and ingredients used. I felt that overtime, the hype may die off, and I’m really hoping to come back to a newer and more interesting menu in months to come. Shugatori is located at:Address: 95, Jalan SS 21/1a, Damansara Utama, 47400 Petaling Jaya, Selangor, MalaysiaPhone: +60 3-7732 2588Opening Hours: 2pm-11pm (Sun-Thurs). 2pm-12am (Fri & Sat). Closed Monday. It was one, fulfilling day, with plenty of new eats.